Saran gets his oversized Lancaster-raised chickens for frying from D’Artagnan. Fans of the Suvir Saran era at Devi are crowding into a West Village storefront with whitewashed brickwork and color-splashed art to explore the flowering of his obsessions with free-form Indian spicing at Tapestry. The evolving menu is witty, grandiloquent, and comforting by design -- partly Italian and assuredly French, with Mexican detours and a bow to how Americans picnic. “When you think of it, Mexico and India have a lot of cumin in common,” FloFab quoted Saran in her opening alert. The newly trim Suvir Saran has set up a new colony in the West Village. Devotees who have kept in touch with Saran’s culinary yearnings through his cookbooks know that he has spent recent years commuting to San Francisco from American Masala Farm in upstate Hebron where he lives with his partner Charlie, raising chickens, geese, sheep, and goats and making kumquat marmalade. His restaurant American Masala seemed endlessly imminent out west. Something Wicked: mescal, habanero, sangrita, pineapple and lime. Whitewashed brick and color-splashed art in Tapestry’s close-packed dining room. 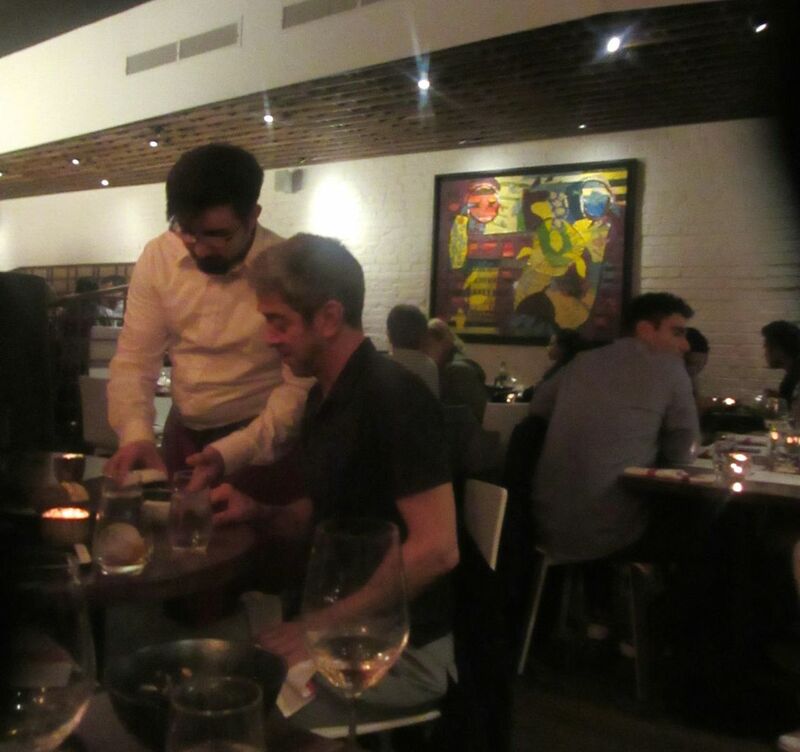 Of course, I knew, there seemed to be endless barriers to the San Francisco restaurant project, but I had no idea he’d been back in New York for fifteen months working on Tapestry without telling anyone. 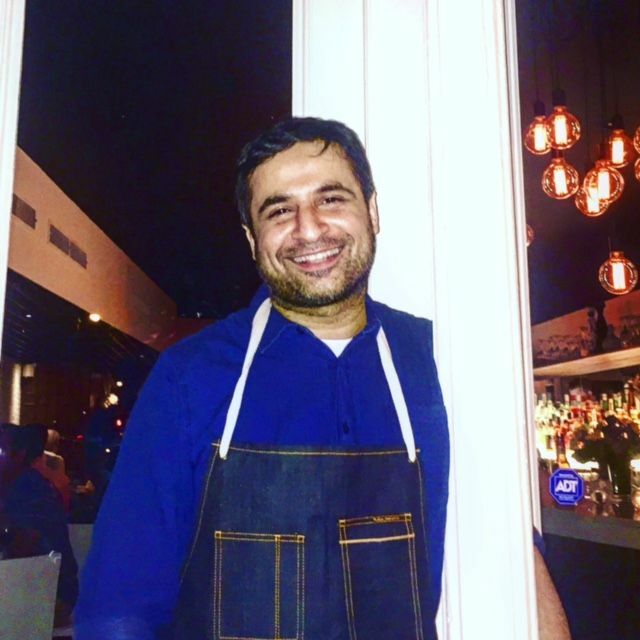 At first he was just the consultant, designing and staffing a restaurant for art and entertainment entrepreneur Roni Mazumdar, who owns MasalaWala restaurants with his father. 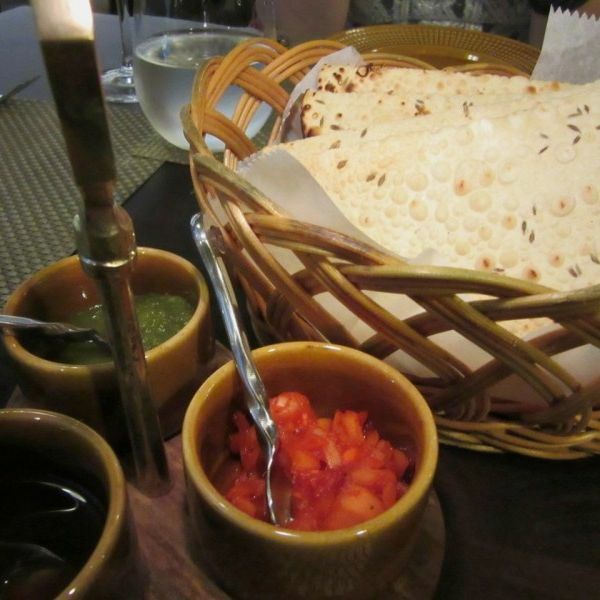 Then Tapestry opened, already booked at most hours you might want to eat. 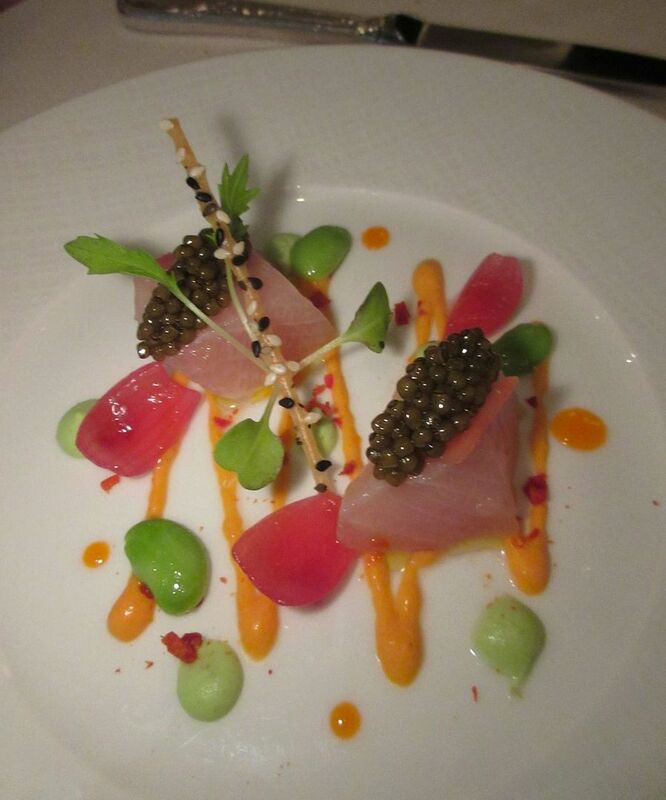 Saran had been persuaded to become a partner and recruited Joel Corona as chef de cuisine. 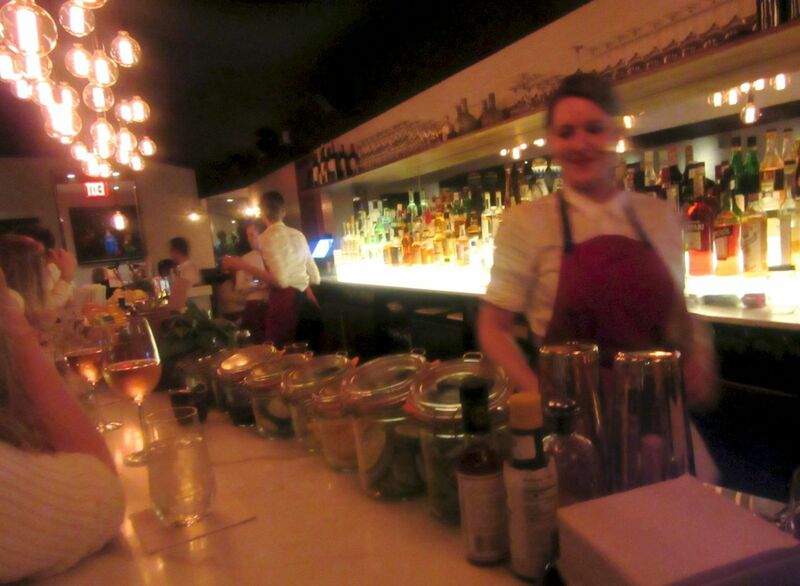 I wasn’t there for a launch with friends and family, but soon enough, without warning, I arrived, gave Charlie a kiss at the long white marble bar with its lineup of cocktail accessories in canning jars, and settled at a table in the rear. A cluster of Edison bulbs hang over the marble bar that curves around the corner. Saran, in a spiffy denim apron, newly trim and boyish-looking after giving up an addiction to Coca Cola, makes the rounds as host. 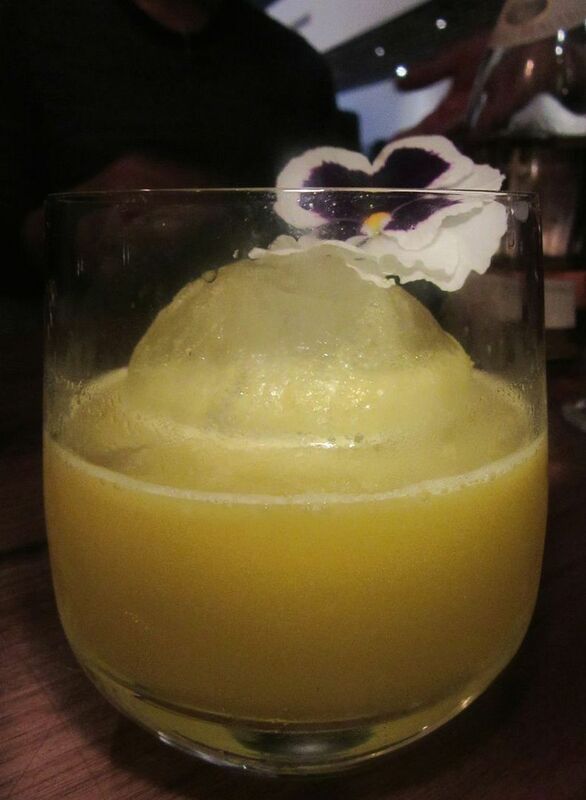 There are the essential creative $14 cocktails with Indian detailing that take a long time to arrive. “Smash the System” (bourbon with muddled orange and an espresso-brandied cherry) gets a workout at our table. My friend’s $18 Sapphire martini looks very small. 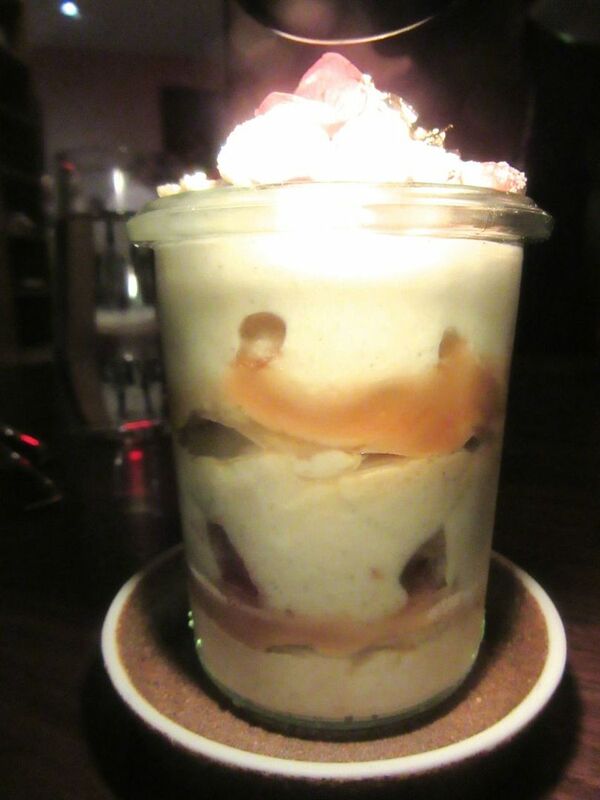 The evening’s special banana pudding is layered into a lilliputian glass. Perfect for Barbie. But it’s not nearly as petite as the sensational banana pudding the four of us are determined to share on another evening, even though it’s smaller than an individual tumbler of Dannon. Saran is indignant when I complain. “It’s small because it’s so rich,” he insists at the end. 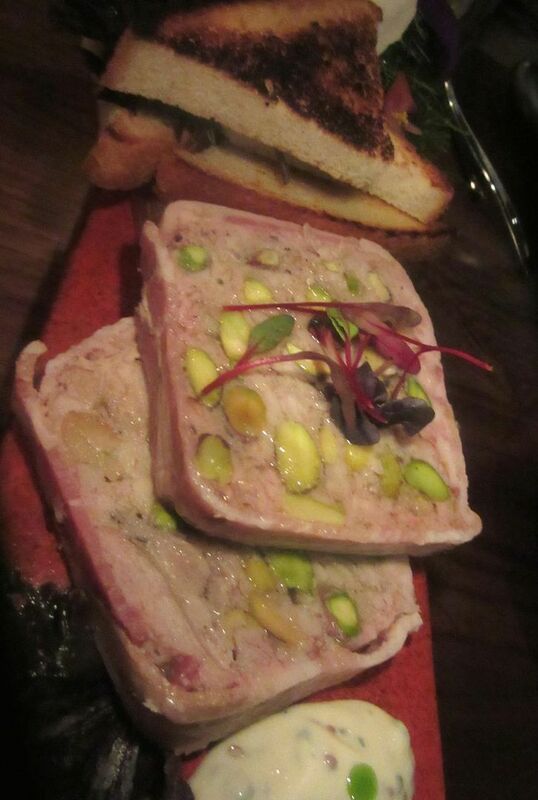 Two thick slices of very French pistachio’d rabbit terrine is enough for the table to share. But size has nothing to do with anything at Tapestry. Some portions in custom-made Japanese pottery vessels are enough for six to share. Others are more measured. There are only three small triangles of toast alongside two generous rectangles of excellent rabbit terrine that first evening. I have the waiter make two separate trips for more. 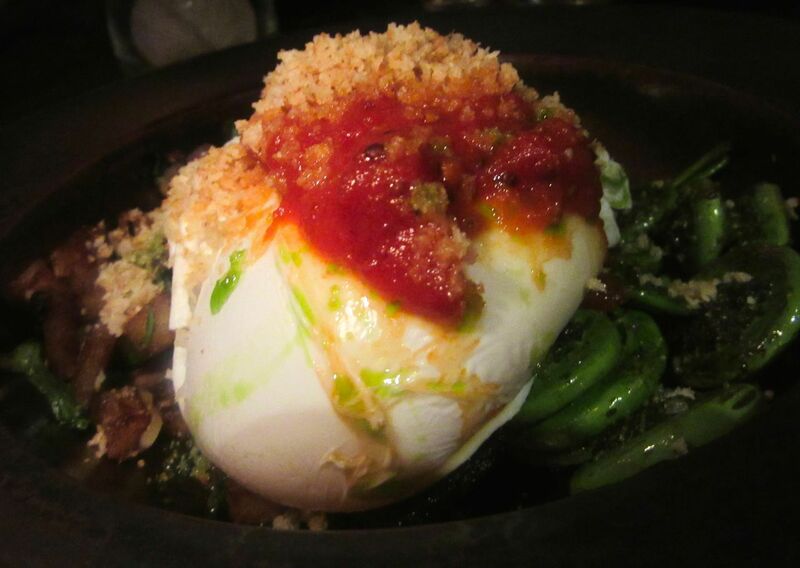 Dinner with cauliflower three ways starts with the Hakka-spiced veggie in tomato jam. 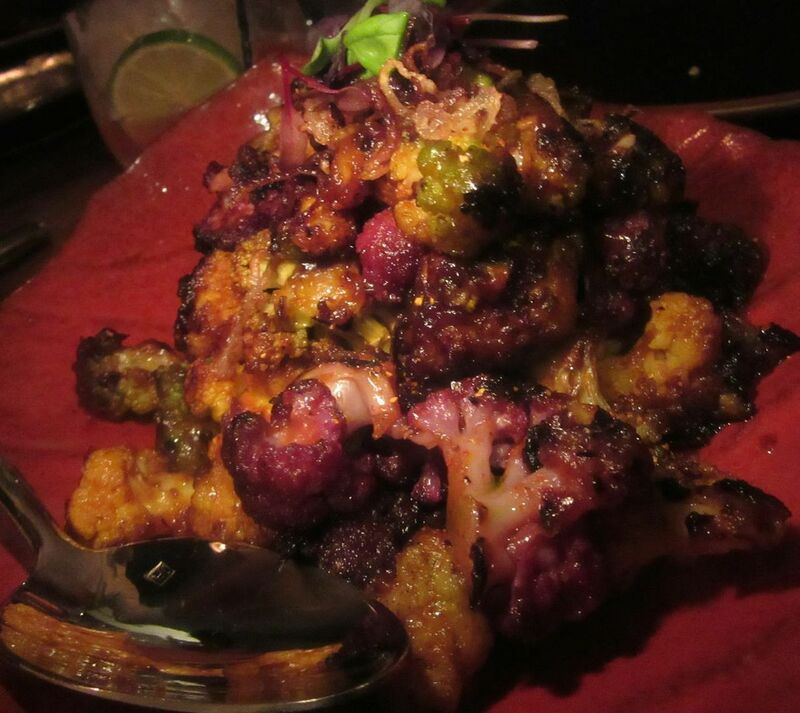 Given the current trending of vegetable creativity, no one in our group objects to the idea that we’ve ordered cauliflower three different ways, starting with Hakka spice-roasted cauliflower with tomato-spice jam from the category listed as “Nashta/Noshing.” That’s a loose translation that proves the New Delhi import is officially an incurable New Yorker. 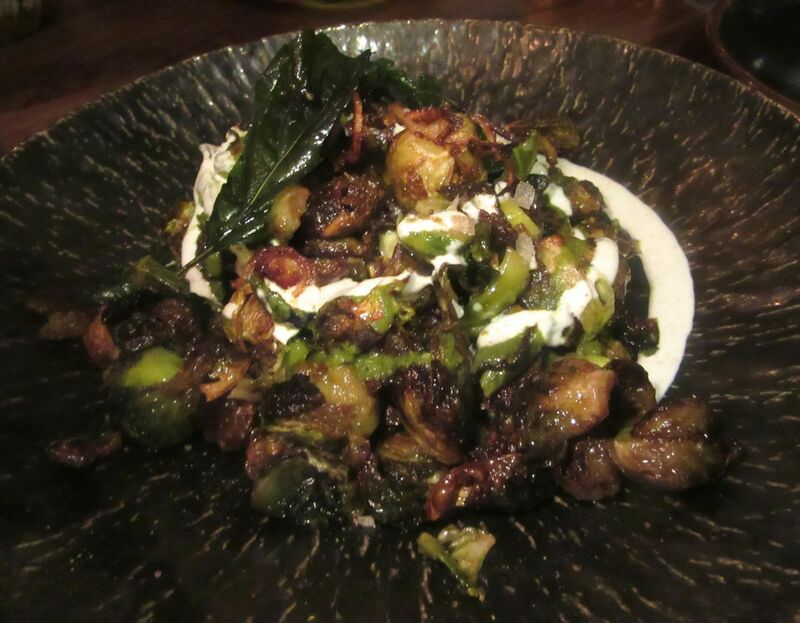 Brussels sprouts chaat gets tossed with tamarind and mint chutney, yogurt and pungent salt. We send the waiter off in search of serving spoons so we can dish up Rick’s cauliflower and pappardelle with chile, garlic and buttery crumbs. Yes, each of us already has a soupspoon atop the imported Italian napkin, but that doesn’t allow for double-dipping. Crunchy Brussels sprouts chaat with tamarind and mint is our second-favorite dish after the special, “Breakfast for Dinner,” that features a thick slice of bacon Saran cured himself at the farm last year under a tremulous giant goose egg ready to smash. Curry leaves, black garlic and chile bring extra heat to the fritto misto. Plantain crisps arrive alongside a tart sea bass ceviche with a chile kick and pickled onions. 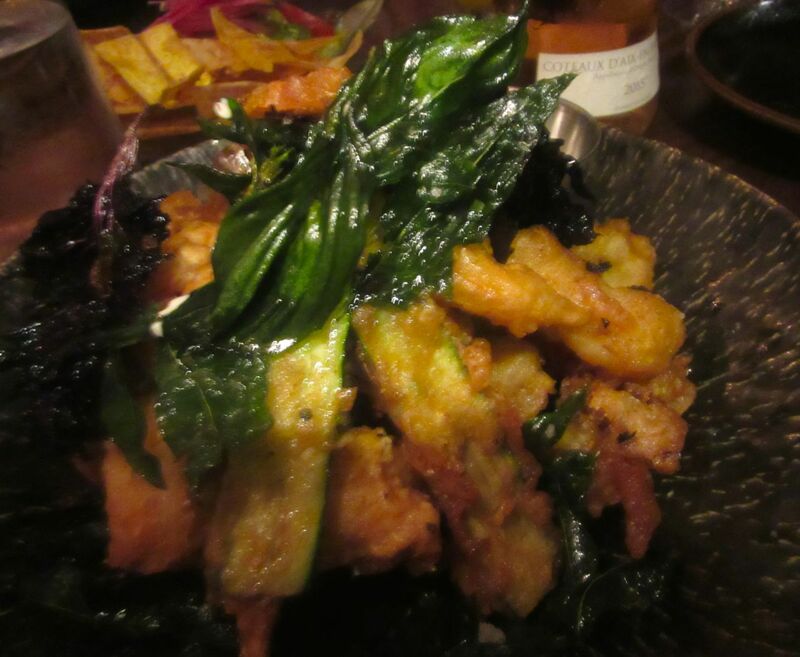 Curry leaves and black garlic give the fritto misto an exotic flair. 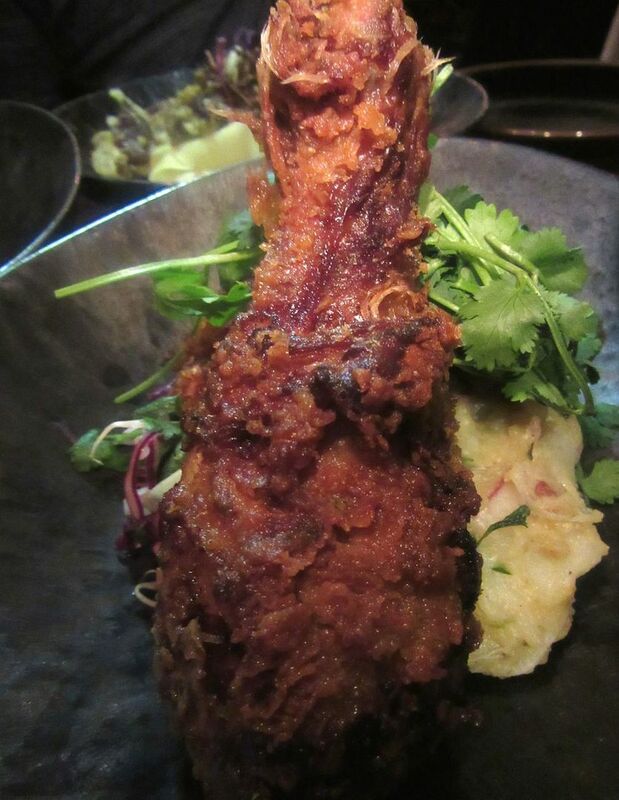 It turns out we don’t need two orders of Masala fried chicken – these pedigreed birds are huge. With peanut slaw and aloo bharta (potato salad) tucked in the bowl, it’s Saran’s salute to an American picnic. 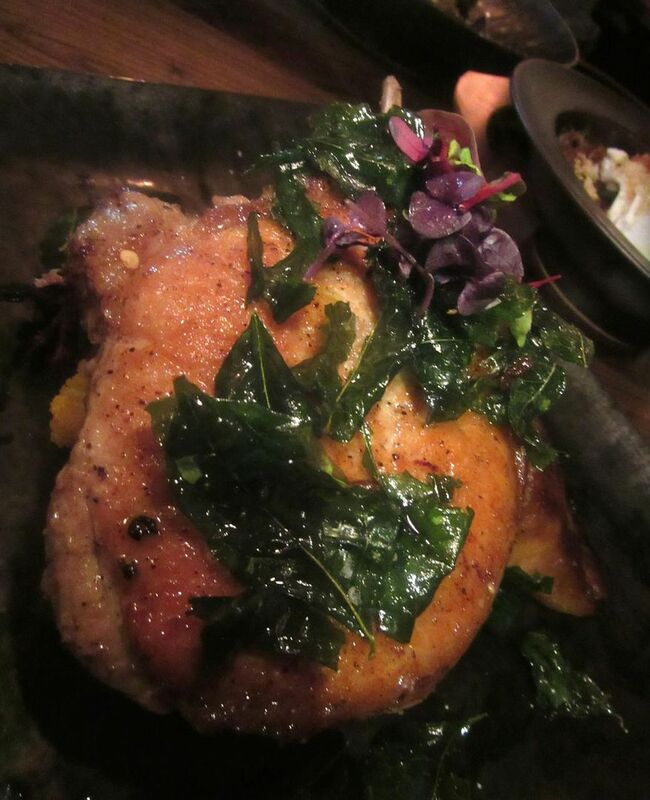 The honey-glazed pork chop was not “rare” as I’d asked but tough and dry. I had asked for the honey-glazed pork chop “rare.” It comes sadly overcooked and a bit dry, with a third iteration of cauliflower – this time, roasted with onions and caramelized apples. Pastry chef Crystal Hanks does a monumental passion fruit pavlova with fresh berries. I’m not a lover of hard meringue. I’m more of a sticky toffee fan. 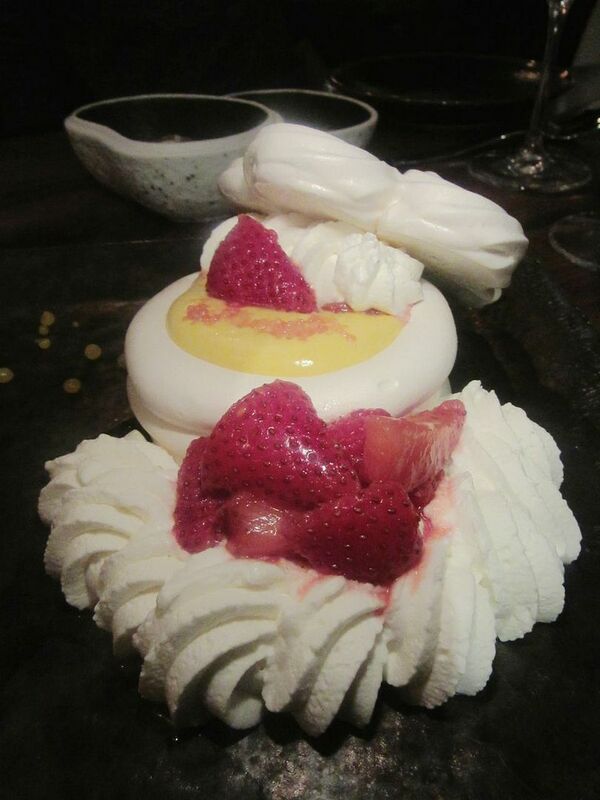 But pastry chef Crystal Hanks’ passion fruit pavlova with fresh berries and whipped cream is exceptional. I wish Saran would let her bake some of his classic American cakes. That essential Michelin-evocative touch: pâte de fruit, candied orange peel and a truffle. The bill, $94 each with tip, strikes me as pricey for the West Village. Granted we over-ordered. Still, noshes can run $23 and entrees are $25 to $45. 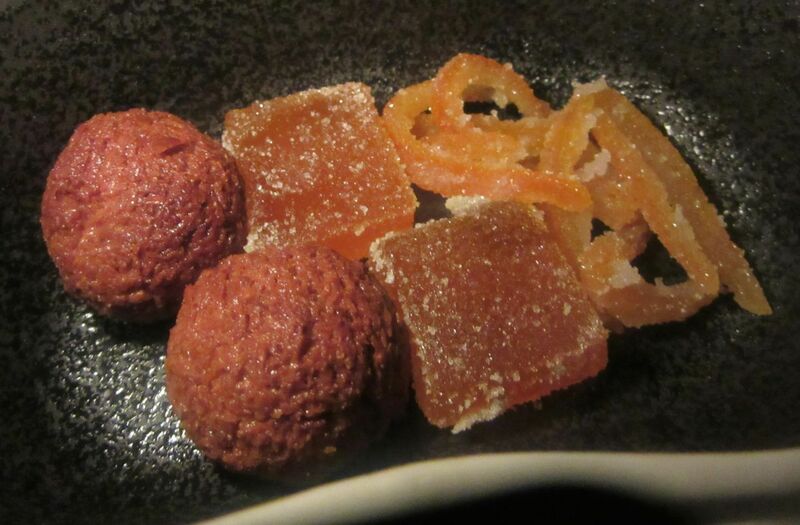 But the Michelin-star-worthy petits fours the house sends at the end -- luscious pâtes de fruit, candied orange peel, and a truffle for each of us -- are disarming, an emblem of haut ambition. 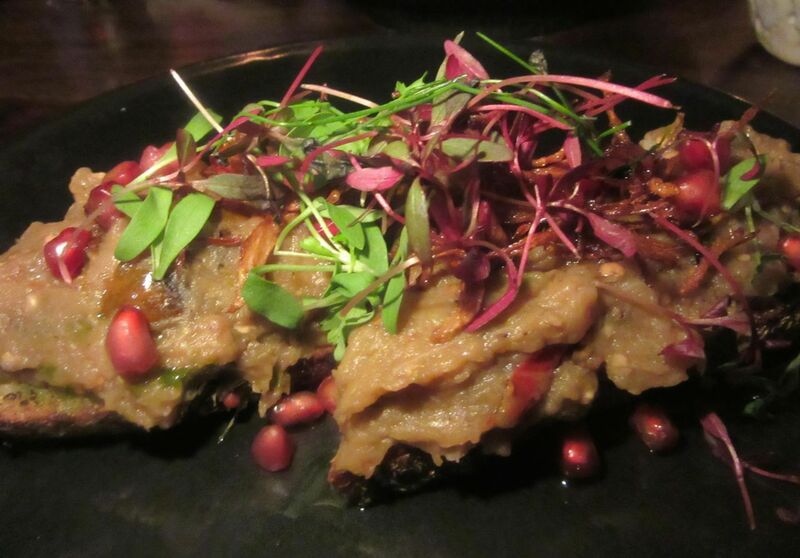 A must: Eggplant bruschetta with pomegranate, cilantro, mustard oil and Parmesan. A week later, I’m back with three friends eager to taste the new dishes. They would be mostly less expensive, the chef has promised. And indeed, fire-roasted eggplant bruschetta with pomegranate, cilantro, onions, mustard oil, and parmigiana is a hit and just $13. The fattoush salad -- a $16 toss of romaine, radish, cucumber, cherry tomatoes, sumac and pita croutons -- disappears too. I long to see a variation on his richer-than-BillGates mac’n’cheese, but so far he’s holding out. Tamarind chicken wings in basil-mint yogurt sauce will test your tolerance for sticky fingers. 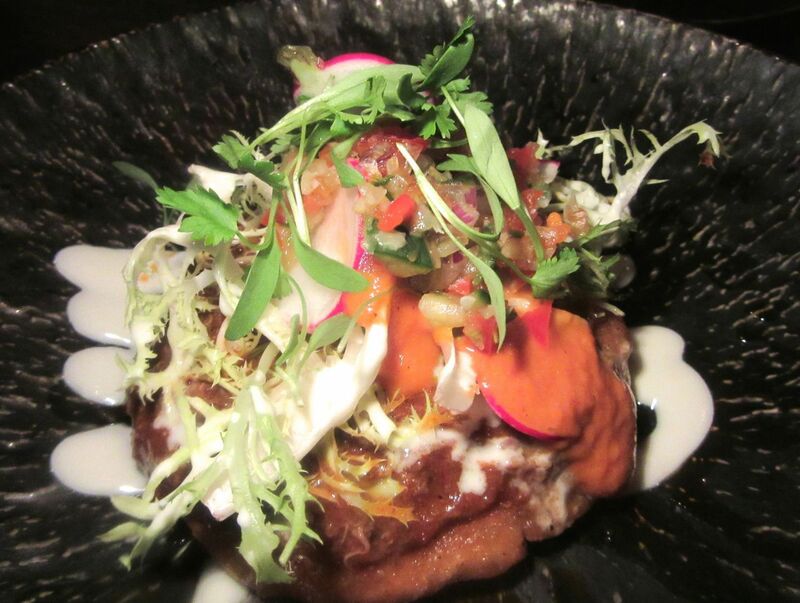 Duck confit sopas with a United Nations of accents sit in a bowl of yogurt crema. 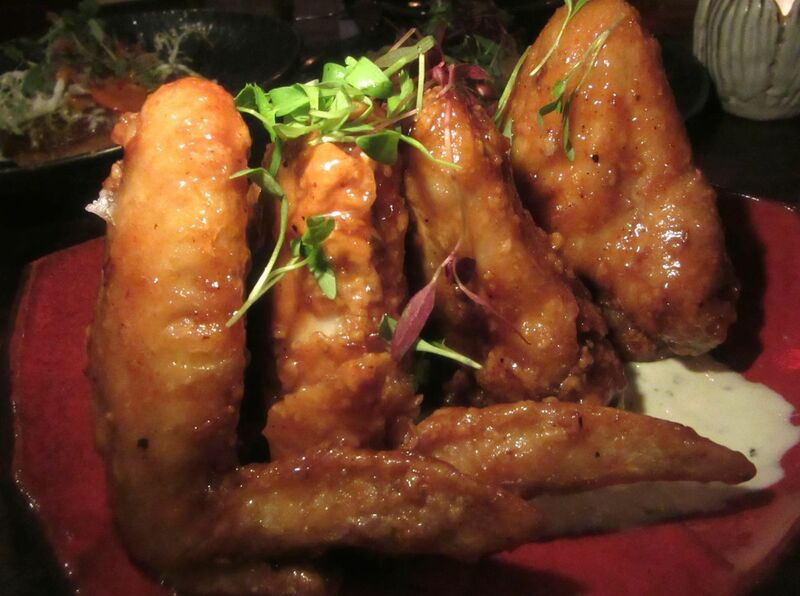 I prefer the giant tamarind chicken wings -- whole and sticky and so huge they could be eagle wings. It’s tricky to cut them apart and eat with your fingers. My companion thinks they’re not worth sticky fingers. But I don’t mind. A dip into my water glass, a dab of the couturier napkin. Wonderful. Now I'm finishing hers. The chicken and goose liver pate hadn’t gelled yet, the waiter said. I insisted. Another standout. 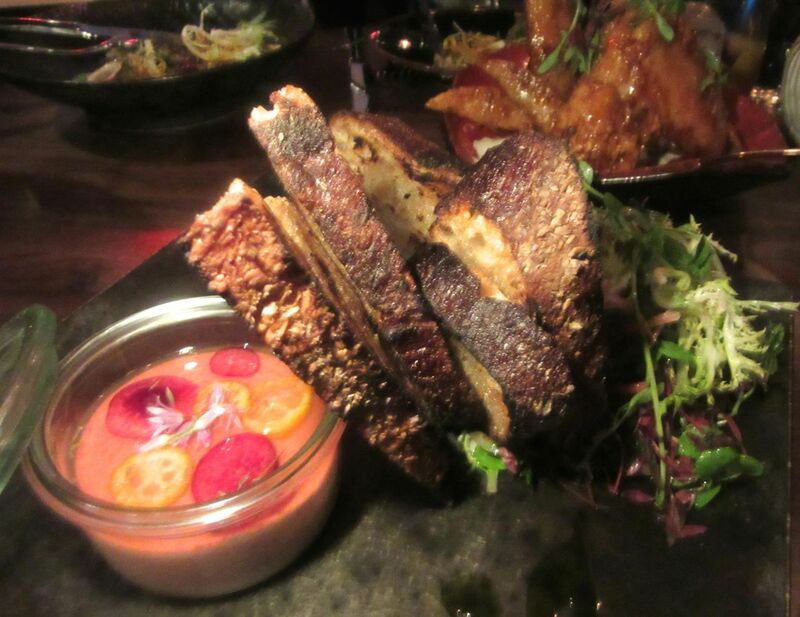 I’m a fool for the $15 chicken and goose liver pate, too. It comes in a canning jar under sauternes-champagne-pink peppercorn jelly, studded with slivers of kumquat. And there is more than enough thick, buttered toast. Under cover of intense conversation across our table, I confess to consuming more than my share. 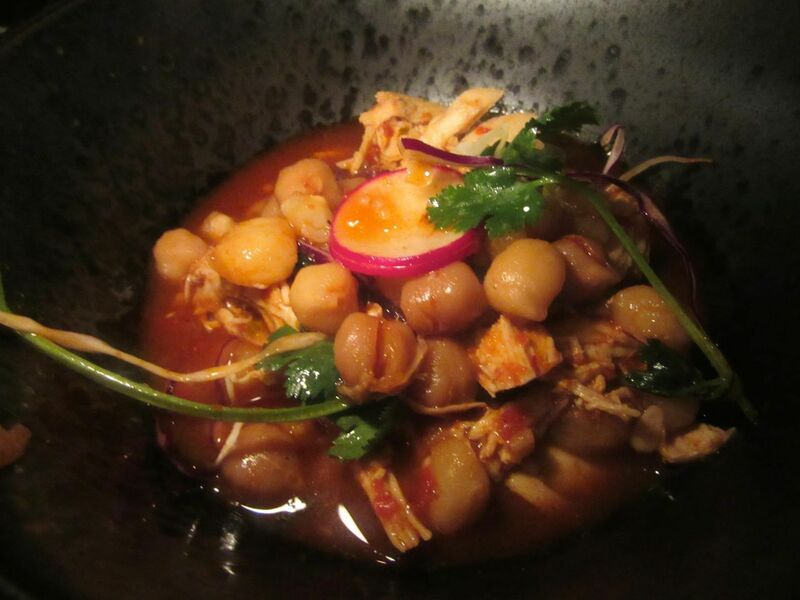 I like the Indian twist in the spicing of the posole but not the dry shredded breast of chicken. 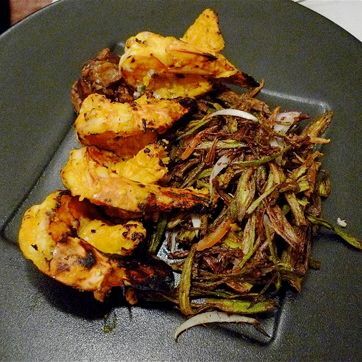 Birbal kee Khitcheree, Saran’s favorite comfort food, could be comfort to a needy population. The menu says lentil and rice porridge. Still, I’m surprised when four soup bowls arrive so we can share the birbal kee khitcheree. 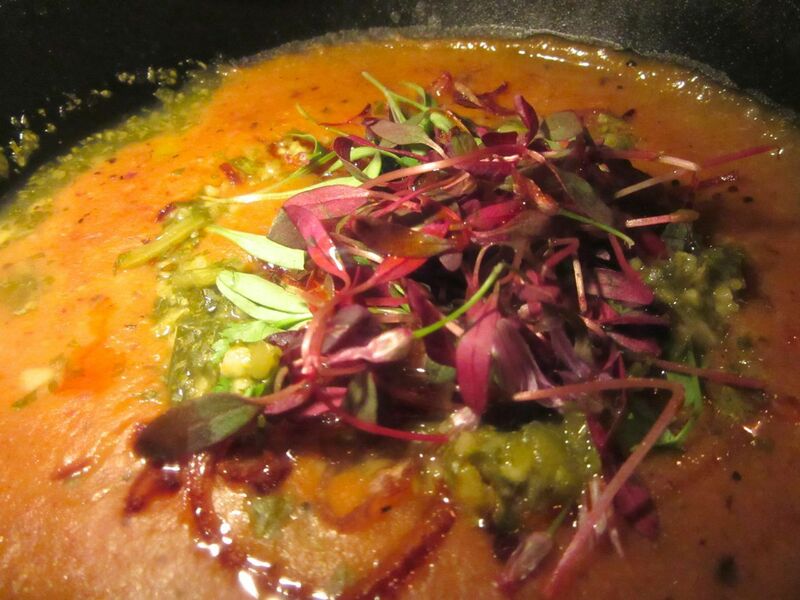 In his American Masala recipe, Saran describes it as a one pot vegetarian meal transported by layers of spices and vegetables sautéed in clarified butter that takes several hours to make. It’s definitely the triumph of the evening. In mid-14th century India, a court official made a khitcheree so enchanting, Saran writes, that the Emperor Akbar decided to make him a Raja. It’s definitely the triumph of the evening. Duck confit sopas on yogurt crema with salsa roja, chopped vegetable salad and pea shoots. My pals alternate between indignation and amusement over the Barbie doll banana pudding. But the goodie gift with its supernal pâte de fruit stifles the clucking. That, and a reasonably gentle check, just $64 each, tip included. There’s no dessert list yet. 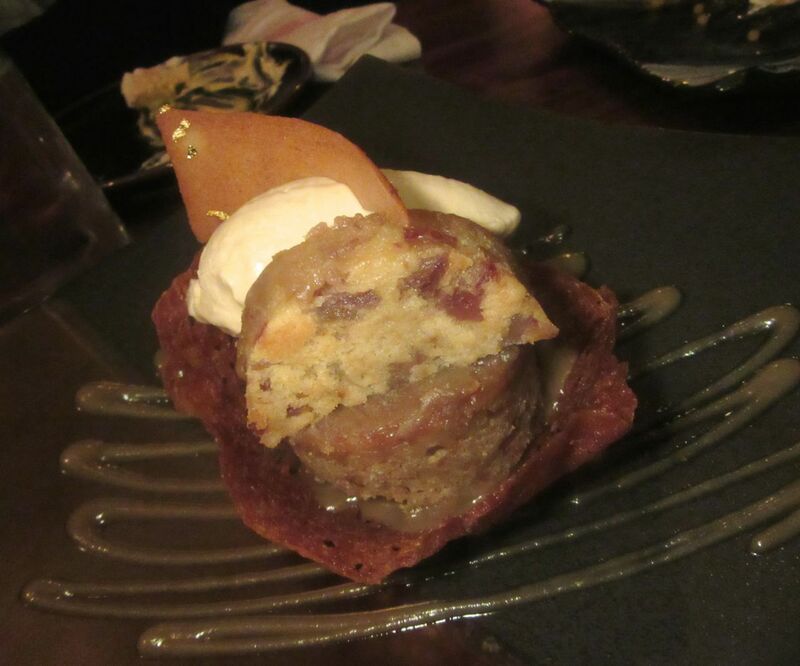 I’ll look for sticky toffee pudding to turn into peach pudding soon. It won’t be just affection for Suvir that brings me back. I’m quite taken with his invention. There’s not much a critic should do for a friend, except possible ignore him. The truth is not everything dazzles. The last-minute shavings on top are too often similar. But I’m eager to see what innovation the summer harvest inspires. And then autumn. It may not be easy to get a table. I’ll abandon discretion, I suppose, and ask for a favor. I’ll hope our friendship survives my quibbles. Photos may not be used without permission of Gael Greene. Copyright 2016. All rights reserved. See my vintage treasures on my Etsy vintage handbag site by clicking here.